Jesus Christ and His holy Apostles teach us that care for our neighbour, for the needy, the sick, the poor, the orphans, the widows, those in prison, etc. is the duty of every Christian. There is abundance of examples of merciful and charitable activities done by the holy Fathers and other prominent Orthodox believers since ancient times and until now. Sts Cosmas and Damian the Unmercenary used to heal people for free, and they also helped poor people by giving away what they possessed. St Nicholas secretly gave money to a poor father in order to prevent him from committing a big sin. St Ioan the Merciful was generous and of good giving heart. St Philaret the Merciful used to give everything he possessed to the poor. Rev. Paraskeva of Bulgaria gave away all her property to the poor, too. St Ioan of Shanghai built an orphanage and cared for abandoned children. Elder Paisii of Mount Athos helped poor people, children and widows. Before 9 September 1944 (when the Communists came to power), the Bulgarian Orthodox Church used to establish and maintain children’s camps, nurseries, kindergartens, interest groups for children, playgrounds, handicraft schools, dairy kitchens for young moms, children’s and young people’s canteens and kitchens, orphanages, old people’s homes, etc. After the Communist regime has fallen, this activity, which is considered to be typically Christian, was re-established and now we can see food banks for poor people, orphanages, Sunday schools, Orthodox children’s camps, centres for spiritual support of drug-dependant people, priest go, visit and take care of those in prison, etc. Being inspired by the example which the holy Fathers showed us, the website milostiv.org decided to organise a contest dedicated to diakonial and charitable work. The contest consists of two parts: one for theology students of Orthodox seminaries and the other for theology students from Orthodox theological departments of universities. The contest aims to make the students think about the importance of the church’s social ministry in the contemporary world while offering their own views on the care for our neighbour. The seminary students are invited to develop their ideas about the ways in which they could offer help or, if they are priest, the ways in which they appeal to other people to take care for the needy. First place reward equals to 1200 Bulgarian Leva (given as a scholarship by 100 Leva a month). Second place reward equals to 600 Bulgarian Leva (given as a scholarship by 50 Leva a month). Third place reward equals to 300 Bulgarian Leva. Seminary students from the Sofia and Plovdiv seminaries, studying in their third, fourth and fifth year, are allowed to take part in the contest. Email where the essays should be sent to: milostiv.org@gmail.com. Short biographical data (up to 250 words). Part Two: for theology students of the four Orthodox theological schools of universities and for seminarians of the adult (the parallel) classes of the Sofia seminary. The students are invited to give answers in their essays on such issues like: What does it mean for us to be merciful and to offer mercy as Christians? Why is this important? How much and in what way can we give help? Can we help others if we are not rich? Whom shall we take care of, what type of activities and work should we support? How do you see the mission of the Church as charitable and virtuous activity? All the students from the four Orthodox theological schools if universities are allowed to take part in the contest, no matter which year of study they are, whether they are at Bachelor or Master’s degree and whether they are full time or part-time students. The seminary students at the adult (the parallel) classes of the Sofia seminary can also take part in the contest. 1. The volume of the essay is calculated by the following parameters: page size – A4, page margins of the four sides of page – 2.5 cm, font – TimesNewRoman, font size – 12pt, line spacing – 1.5. Such a page contains some 350 words, which means that the essay should not be larger than 2100 words (6 pages by 350 words). The students from the universities (but not the seminary students) are expected to provide in their essays at least three bibliographical works (books or articles), in addition to links to websites. By this they can support their views on mercy and the ecclesiastical social activity. It is advisable (but not obligatory) that the essays are at least 4 pages long. No essays will be accepted if they have not been developed in accordance with the rules of essay writing, including the presence of introduction, main thesis and conclusion; for the university students’ essays, bibliography is also necessary. The bibliography is not included in the essay volume (in the 6 pages of essay)..
2. Every participant in the contest needs to seek for necessary sources and literature (and internet links) by themselves, thus drawing the necessary information to help them develop the essay theme. 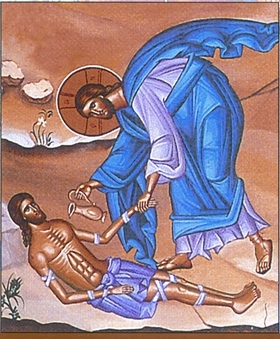 As an additional helpful tool, you can use the concise overview of citations from the New Testament, concerning mercy and care for our neighbour, which can be found at the website of “Merciful:” http://milostiv.org/text.php?id=477. The quotations have been taken from the Synodal edition of the Holy Scriptures of the Old and the New Testaments of 1992 (the edition is published at http://www.pravoslavieto.com/bible). 3. The essays may contain views and citations of other people’s opinions but it should also show your own vision on the diakonia, mercy and charity in the Church as her important missionary activities. In your essay we would like to see your suggestion about how such activities can be organised in your parish or in your eparchy in the form of working ecclesiastical social ministry which can be practically implemented and worthily fulfilled. The essays will be carefully examined and evaluated by an examination committee consisting of the following members: Chair – Dr Valentin Kozhuharov, Lecturer in Christian education and in Missiology, and members – Priest Dr Stoyan Chilikov, Assoc. Prof. in the department of theology of Plovdiv university, and Priest Konstantin Tsankov, teacher of Patristics in the Sofia spiritual seminary. The final mark will be defined by the examination committee Chair in consultation with the other two members of the committee. Marking will be done according to the six-level mark system where two intermediate marks will be used, thus offering seven levels of evaluation: unsatisfactory (2), satisfactory (3), good (4), very good (4.50), very good (5), excellent (5.50) and excellent (6). The results will be announced in May 2014 and the rewards will be given in the same month in the Sofia spiritual seminary’s Assembly Hall. All the contest participants will be informed well in advance about the date of the reward giving.